My trip to the Dominican Republic began when representatives from FAME (Fellowship of Association of Medical Evangelism) came to our church to share missions opportunities. Our church supports FAME and I was interested to learn more about their ministry. When the representative began talking, I knew immediately that God was calling me to go. I had never been on a mission trip but we started planning right away. We arranged for our youngest daughter and foster daughter to be cared for by family while we were away. The trip was amazing. It was better than any family vacation and it didn’t feel at all like work. As physician, I always needed to be in control (scheduled office appointments, call, etc) and always worked hard to maintain order. Despite my inability to control this situation in any way, God was with us throughout the trip and taught me to let Him do the leading. When we met our group in Miami for the last part of the journey to the Dominican, I gained a sense of peace that I knew would sustain me throughout the trip. When we arrived, I was amazed by the Dorsey’s hospitality. They treated us as if we had been best friends all our lives. They were so open and real. The daily medical clinics were wonderful experiences. The people were so poor and had so many needs that we couldn’t satisfy especially with very limited resources. However, in all situations, we did all we could to make a difference. 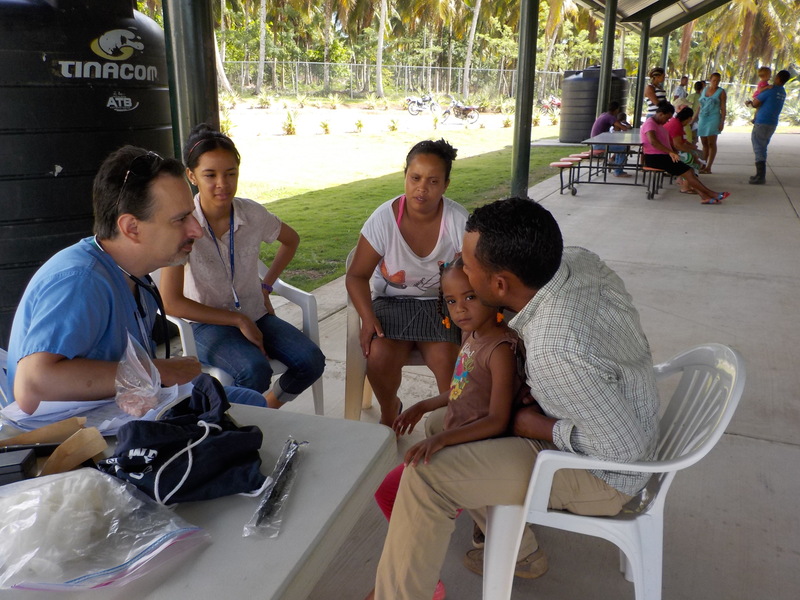 Besides providing medical care, I was able to address their spiritual needs. I prayed in Spanish to try to personally connect with those who didn’t know the love of Jesus Christ. The patients were all so grateful and shared their lives with us. One of my favorite parts was witnessing to a young family when the youngest daughter started singing a hymn in Spanish to me. Her heartfelt love for Jesus was clearly evident in her passionate smiles. A home visit allowed me to visit an elderly man confined to a 6’ by 8’ room due to a stroke. He had a picture of Jesus on his wall and sang praises with his garbled speech with great fervor in praise to our Lord and Savior. Besides the joyful moments, there were heart-wrenching situations also. One of my patients was brought in for treatment but his dementia had progressed to the point that he couldn’t make a decision for Christ. Another patient spoke only Creole as she was from Haiti. The Haitians are hard workers and were brought into the Dominican to do hard physical labor. My words had to be translated into Spanish then into Creole and vice-versa to learn of her insurmountable plight. The fellowship with God’s people was amazing. Leslie, Franklin, Elsa, Fredelina (of the Dominican Republic), and many others touched my life greatly. The fellowship with the team really made me feel at ease. It was fun learning more about Steve’s plans for the mission. Despite not having any first world conveniences, we were happy and more than satisfied. We didn’t care about television or the news because it didn’t bother us. The beautiful tropical climate was also peaceful and refreshing. Our children learned about the true meaning of Christian love. In the future, we can’t wait to return. In just one week, our lives were so affected in ways in which we will never comprehend. Through all, may God be praised. Dr. Carter! Hope I can serve with you all again!